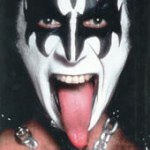 GENE SIMMONS, KISS: President Obama, I voted for an idea. What I didn’t realize what I was getting was an idealist. If you’ve never been to the moon, you can’t issue policy about the moon. You have no f—king idea what it’s like on the moon. For a president to be sitting in Washington, D.C., and saying, “Go back to your 67 borders in Israel,” how about you live there and try to defend an indefensible border nine miles wide? On one side you’ve got hundreds of millions of people who hate your guts, on the other side you’ve got the Mediterranean. Unless you control, in Israel, unless you control those Golan Heights, it’s an indefensible position…. “The most pathetic body on the face of the planet.” Simmons called the U.N. a “paper tiger” that allows dictators to spread propaganda. I-I-I-I, wanna rock and roll all ni-i-i-ght, party e-vuh-ry…Well, actually I should really rock and roll all day. Come sundown I have to unplug for a bit. But if you unplug at night, how can you see the scorpions? I don’t see them. I FEEL them. The best post I’ve ever seen! I’m the biggest KISS fan ever! Gene Simmons is brilliant & amazing!! Ha!